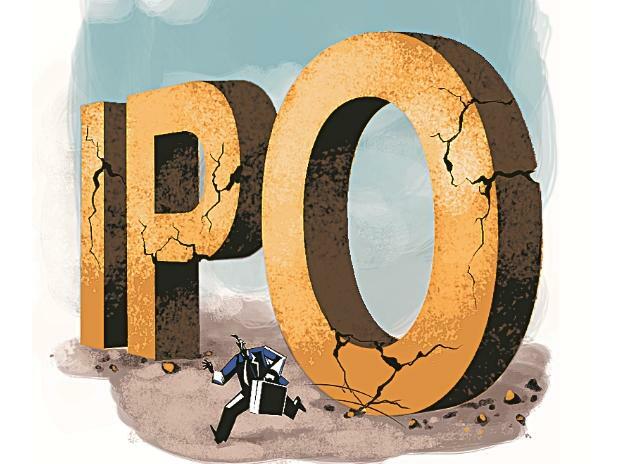 The initial public offering (IPO) market witnessed a huge slump during 2018-19 (FY19). Funds raised by the way of IPOs were down 82 per cent year-on-year (YoY) to Rs 14,674 crore. The number of issues to hit the market were just 14 — the lowest since FY15 — compared to 45 in FY18. The slump in primary market activity came even as the benchmark indices gained the most in four years, at 17 per cent. Market players said a spike in volatility — particularly in the broader market — took a toll on primary market activity. Typically, firms that come out with IPOs belong to the mid-cap and small-cap universe. The Nifty Midcap 100 index fell 4.4 per cent in FY19, while the Nifty Smallcap 100 ended with losses of 16 per cent, despite a sharp recovery in stock prices over the past two months. At one point during the financial year, both the broader market indices had slipped into bear market territory, having come off by more than 20 per cent each. FY18 was a record year for primary market activity, with Rs 81,553 crore getting mobilised through IPOs. Although returns for the benchmark indices were lower in FY18 as compared to FY19, the up-move in the market was broad-based and far less volatile. “The primary market does well when the secondary market is less volatile. The last fiscal was one such year. This time, however, the surge in volatility due to both global and domestic factors made deal-making difficult,” said an investment banker. 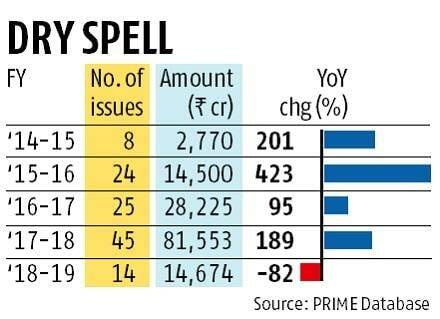 In FY19, nine companies — collectively looking to raise Rs 6,495 crore — were not able to launch their IPOs despite having all approvals in place. The fund raising outlook for FY20 hinges on the election results, says PRIME Database, an IPO tracking firm. “If the elections throw up a fractured mandate, many more companies are likely to let their approvals lapse. On the other hand, if a stable government comes to power, there will be a flurry of IPOs,” said Pranav Haldea, managing director of PRIME Database. At present, there are 64 firms having regulatory approval for an IPO, worth a cumulative Rs 63,000 crore, according to PRIME Database. Another eight companies, looking to raise Rs 7,600 crore, have filed their offer documents with the Securities and Exchange Board of India, awaiting the regulator’s nod. “This pipeline could vanish quickly in case markets are volatile,” said Haldea.